Anymore, Adelaide does not leave home for much more than doctors appointments and maybe the occasional lunch date with mom and dad. One of the big reasons is the amount of STUFF that has to accompany her. As Miss A’s condition has worsened the list of supplies and equipment that must always be with her has grown. I remember a year ago we use to carry around a small cute pre-school sized ladybug backpack for her with a few diapers, wipes, syringes and a spare g-tube extension. When our home health nurse began one of the first things she did was request a larger backpack for Adelaide and then proceeded to quickly fill it to capacity. Inevitably, this past Christmas, Miss A received a duffle bag. Don’t worry it still has a ladybug on it because heaven forbid we not be on brand. The additional space and pockets have helped keep us organized and actually able to find what we need when we need it. Imagine that! She’s clearly not packing eye creams and mascara - I mean with lashes like hers, who needs it! But there are a few other necessities she requires: diapers, wipes, diaper rash cream, extra change of clothes, socks, sunglasses, washcloth and blanket. Swap out goldfish crackers for a bag of pureed food and we’re still not so far off from your typical diaper bag. Then we add in the first-aid kit basics: thermometers (one oral, one rectal), tissues, bottle of water, gloves, masks, sterile gauze, medical tape, bandages, alcohol wipes, scissors, hand sanitizer and the blue sucker ball thing. Ok, so maybe it’s a deluxe first-aid kit. That’s sort of where the normal(ish) stops, though. From here on out we are medically prepared for just about anything: a feeding pump bag, g-tube extension, mini pulse-ox, pulse ox probes, nasal cannula, nebulizer kit for breathing treatments that can connect to her oxygen tank, stethoscope, syringes of varying size, a pill crusher, deep suction catheter, rectal diastat (administered if her seizures last longer than a set amount of time), lubricating jelly (would you want anything rectal in your go-bag without lubricant? I didn’t think so), an epi pen (should she have a mast cell reaction that gets out of hand), and a pee pad (in case we have to change Adelaide’s diaper on the floor which is happening more frequently as she is outgrowing the changing tables in many restrooms…assuming they have one). 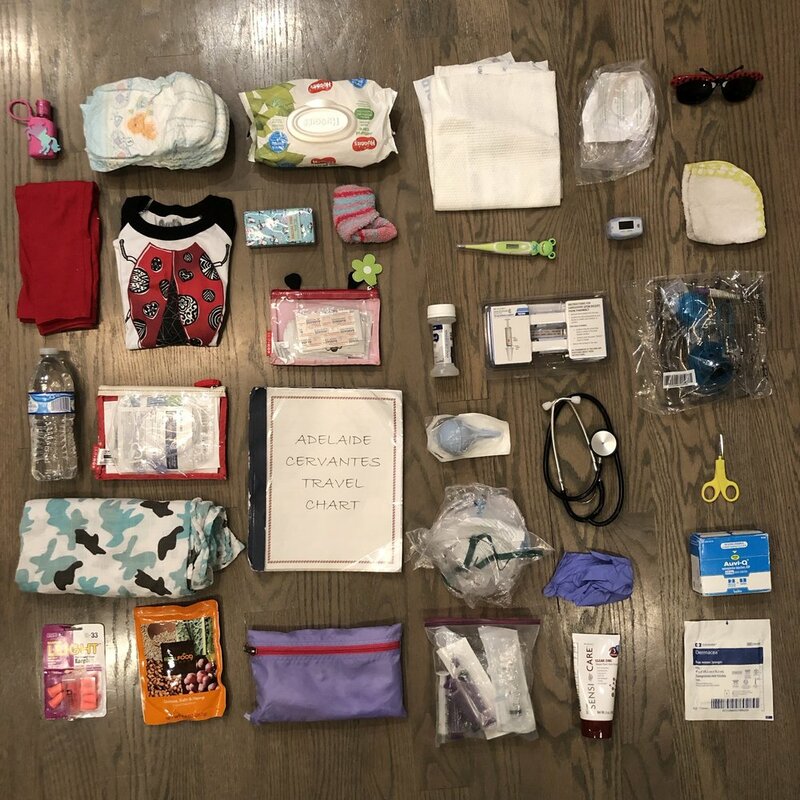 However, the most important item in the go-bag is likely her travel chart which lists all of the meds she is on, when she takes them and at what dose. It also lists out who her main doctors are as well as how they can be reached. Muy muy importante. In the 30-minute scramble prior to leaving the house, we will also add in whatever meds Adelaide will require while we are out plus the next round of meds she’ll need after that just in case we get held up and are away longer than anticipated. She will also need a puréed feed meal, her feeding pump and an ambu bag. You’ve seen ambu bags on every medical show when they are in the ambulance and are squeezing the big blue balloon that pushes air into the unconscious patients lungs - its that thing. Last minute we may throw a couple books or a stuffed animal in the go-bag as well. Yeah…it’s a lot. 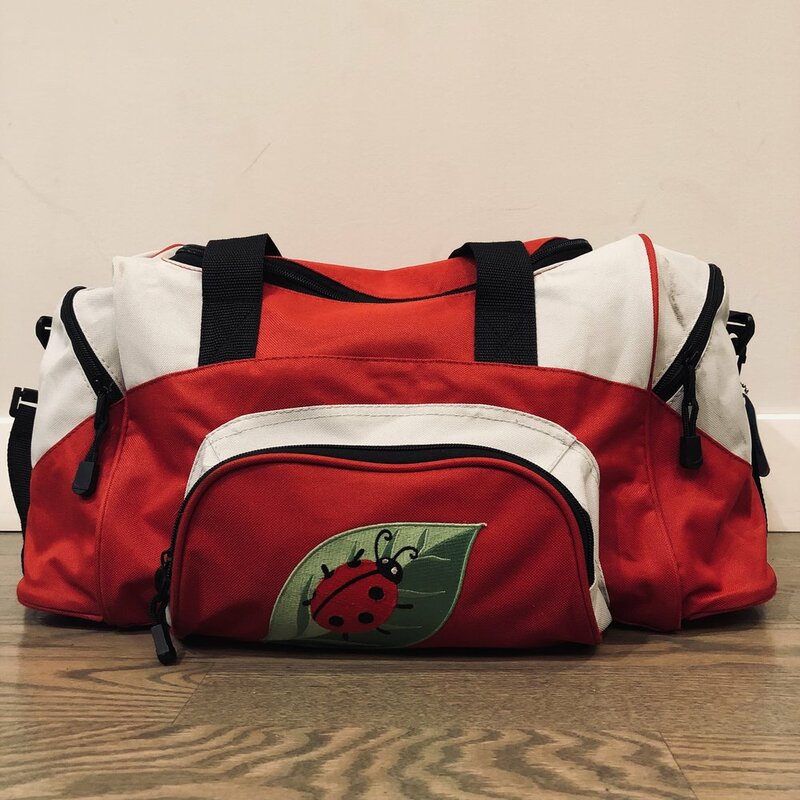 Thankfully, the ladybug duffel is never unpacked: clothes are switched out, supplies refreshed, med list updated but when it’s time to leave the house this bag is typically set and ready. Also on the everyday travel list is at least one oxygen tank, her suction machine to help clear secretions from her mouth, and her pulse ox to monitor her blood oxygen levels. 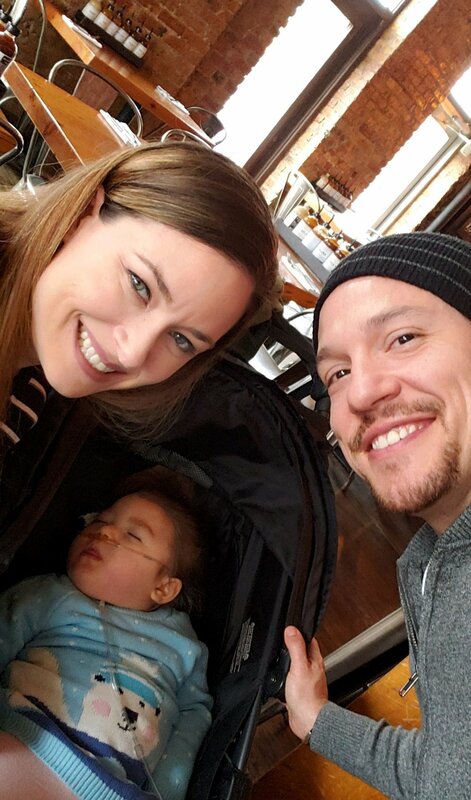 Depending on how long we will be out and where we are going we may need to haul an additional oxygen tank along and charging cords for her various equipment. As of this week, we now have to bring her bi-pap ventilator with us as well. Yay! Did I mention that all of this equipment has to come with us whether we are going out for a doctors appointment and anticipate being away for a couple hours or if I’m going to pick up Jackson from school and will be away for 20 minutes? Basically, when our nurse isn’t on duty I’m a hermit and now you understand why. So, thank you for playing “What’s in Adelaide’s bag” with me. I don’t have a cool giveaway that you can register for like they do in the magazines… unless you are in the market for a used rectal thermometer. I’m sure I have a few extra’s lying around. No? Yeah, that’s cool, I totally get it. What do you carry in your complex kiddos go-bag that is a lifesaver (figuratively or literally)? Share below!